Raspberry Macarons - Let the Baking Begin! 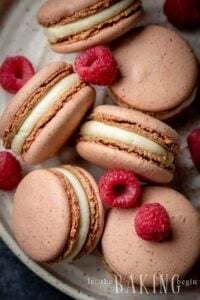 Raspberry Macarons – Sweet little confections made of almond flour meringue and raspberry filling. These are very fragile cookies that have the perfect combination of the sweetness and the tang. 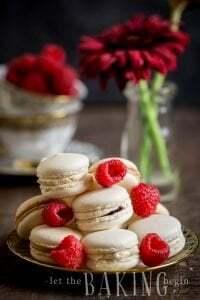 Raspberry Macarons are sweet little confections made of almond flour meringue and raspberry filling. The filling is what gives the macarons it’s flavor and this one is delicious! We all heard horror stories about how tricky macarons can be. Some have tried making them, failed and never tried again. Some kept trying until we got that perfect batch and did a little dance around the baking sheet. Here I want to share a trusted recipe that I have been using for at least the last 6 years. Yep, I started making them before they were everywhere, and before it was ‘cool’ to make macarons. I remember the first time I made them and decided to bring them to a baby shower, they were colored blue with dark chocolate ganache, people had no idea what they were or what they were called. I heard someone call them, ‘those meringue things’. Most that saw my macarons said that they really didn’t think anything of them (because they just looked like two meringue cookies), until they tried ‘em. By the time the word spread that they were ‘French’ cookies, those that tried macarons first, made sure there was no more left for the rest that haven’t, well, at least it seemed like they did. An interesting fact – my dad does not appreciate meringue desserts in any shape or form, but his inner French awoke from deep slumber when he had a bite of macarons. Upon leaving my house, he left with his signature phrase, “can I have about a hundred of these ‘to go’?”. I love my dad’s sense of humor. So if you haven’t tried your hand at macarons, do. There’s nothing to be afraid of. Just read the recipe and you will see. 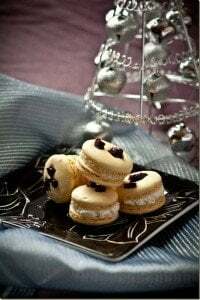 Raffaelo Macaron – A delicate Coconut Macaron shell, then filled with a delicious White Chocolate Ganache. 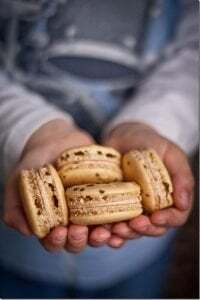 Salted Caramel Macaron – For the caramel lovers! Preheat oven to 300F. Line 2 jelly roll sheets with parchment paper or silpat. Prepare a piping bag with a ¼ inch round tip. Separate egg whites from egg yolks, being careful not to contaminate the whites with the yolks. Measure out 100 grams of egg whites (about 3 eggs), cover with plastic and let sit at room temperature overnight. OR – microwave for 20 seconds, in 5 second intervals, mixing after each stop. In a bowl of a food processor, combine 200 grams powdered sugar and 100 grams almond flour. Pulse to combine, about 20 seconds. Then pulverize for about 2-3 minutes. Start whipping the egg whites with a pinch of salt. Once foamy, slowly add the granulated sugar and whip until stiff peaks form. Add ½ the powdered sugar mixture and with a very quick mixing motions, make about 5-6 swirls with a spoon, to slightly combine the meringue with the powdered sugar mixture. Add the other ½ of the dry ingredients and carefully fold it in until fully combined. Take care not to overmix. Stop when the batter falls in a thick ribbon and disappears in about 30 seconds. Fill the piping bag with batter and pipe out 1 inch circles, about 1.5 inches apart onto parchment paper. Rap the sheet against the table good 3-4 times to remove any trapped bubbles very important. Sprinkle whatever topping (sprinkles) you would like on top of each round. Slide the first sheet in the oven and bake for 10-12 minutes. Do the same with the second sheet once the first one is done. Let the macarons cool. Carefully peel off the cookies by just lifting them up, or using a thin knife to slide right under each cookie to release it. Whip room temperature butter, vanilla extract & the food coloring until fluffy (scrape the bottom of the bowl throughout the process), about 2-3 minutes. Slowly pour the condensed milk, with the mixer still running and stop, as soon as the condensed milk is incorporated. Fill a pastry bag, or a ziplock bag with cream. Pair each half of the cookie by size. Pipe a ‘ring’ of cream around the edge of the cookie, leaving space in the middle for the raspberry. Place ½ raspberry in the middle. Close with a matching (by size) half and press gently to stick the two halves together. You can leave the buttercream uncolored (well as macarons, for this matter), but I think they look better this way. For other delicious raspberry recipes click HERE. Do the raspberries let their juice out amd make them soggy? A usual can is 14 oz, so half would be 7 oz. Do you know if I can freeze them? Hello Marina, do you use boiled condensed milk or raw? Wouldn’t it be to watery if you use raw? Cooked condensed milk does not go well with raspberries, so use raw. But try to find the cheapest brand condensed milk you can find, those are the best for buttercreams because they’re thicker. Also, some butters have lesser fat content so they don’t take on condensed milk as well as others, so when you’re whipping it, watch the buttercream, if you see the slightest hint of separation, stop the mixer. Hi there, for the buttercream do you use regular or sweetened condensed milk?? Marina I am making this tomorrow , do I have to use food gel? Can I just use original food coloring !!?? If I wanna make them 2-3 days before serving, and I wanna fill them with nutela. . . Sorry I just noticed your message because it was in my junk folder for some reason. Yes you can make it 2-3 days before, and you don’t even need to keep it in the refrigerator because nutella does not need to be refrigerated. If you make it with fresh fruit (raspberry for example) put it in the fridge until ready to serve. Do you sift the dry ingredients through after you pulverize them or just mix them in as is? Yes, after you pulverize it you need to sift it into the batter, otherwise you will have lumps in the mix. I made my first batch today. Didnt turn out. Of course i probably overmixed. I don’t have a food processor so i attempted to mix sugar and flour on the magic bullet. I came out clumpy. Not sure if that’s normal. And when they baked they cracked in the middle. Any tips are appreciated for my next batch 🙂 On the plus side, I love how smooth they look on top. If you know that you overmixed, then that is your answer 🙂 Also, the fact that is was lumpy also might have to do with it. after you process it in your magic bullet, sift it into the meringue, this will get rid of the lumps. Also, is it possible to add a lil less sugar? They seemed a lil too sweet. 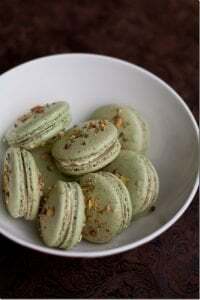 Thank you for this great recipe.I have read, researched, and dreamed so much about macaroons. I’ve tried quite a few different recipes and I must say I will settle with yours. The consistency of this dough is perfect! I will be making my 4th batch of these tomorrow in just this one week! Bridal shower, baby shower, they are fast becoming popular! 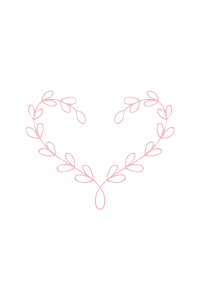 I am excited to try more of your recipes, as I am also a passionate baker always looking for new recipes. Thanks again and keep them coming! I’m so happy you found this recipe helpful! I have tried different recipes and this one seems to work best for me as well. Regarding the egg whites: should you add 100 g of egg whites *after aging* or measure out 100 g, then age them, then just add them no matter the end weight? Measure out 100g then age them, or just heat in the microwave in short intervals, the result is the same. I was wondering if you had this recipe in cups rather than grams. Thanks!! Thank you! I guess I’ll just use my kitchen scale 🙂 These look delicious! I want to try them out! Yes, definitely use the scale if you have one. Most of the macaron recipes that I have tried require letting them sit unbaked for about 30 to develop the “feet”. I see that you don’t mention this in your recipe. Do yours still develop the feet like they should? The biggest issue I have with macarons is how to make them perfectly sized. I never let mine sit out, unless I pipe more than one batch at a time and they just wait on the counter to be baked, but even the last batch is no different than the first one I put in my oven. There is no reason to let them sit out as they turn out perfectly even without sitting out. Try splitting a batch in two, leave one out and bake the other one right away, you will not see a difference. A big thing is though, to bang it on the counter about 5-6 times to get all the air bubbles out, which will prevent possible cracking. Stunning colors! First I thought it was all from raspberries 🙂 but then I saw you used pink gel. Pinned this one, too. I’ve made the macarons many times before but have not perfected a beautiful color like yours, may I ask what brand of food coloring gel you use and what is the best place to purchase it? Thank you! But the brand of food coloring I use is called “Americolor” and it’s a gel color. Hello Marina, do you know a cream cheese filing I could use for this recipe? I really want to make these soon. Cream the powdered sugar and cream cheese together, then add butter and cream again. cream powdered sugar & cream cheese togther, then add heavy cream and vanilla. Whip untill fluffy. Either of these recipes will work but you need to refrigerate macarons after you fill them, and eat them as soon as possible. The cream cheese filling will soften the macarons. Does your original filling not soften the macaroons as the cream cheese filling does? It does not because it’s butter based. After 24 hours in the fridge the inside becomes just slightly moister then in the begining, but not much. With any kind of whipped cream/cream cheese frosting, there will be much more moisture absorbed. Is the condensed milk cooked? Thanks! Nope, it’s regular or raw condensed milk, straight out of the can. Oh no, it’s not butter. It was egg whites. This is a different method of making macarons where they make thick batter with almond flour, powdered sugar + egg whites, and later add the whipped egg whites and syrup (Italian meringue). Yeah, I do wish I knew what they were saying also)) I am always intrigued by videos like these, – it’s interesting to know what goes into making what you’re about to eat (if you were to buy one from Laduree).